Tweeter and The Monkey Man is sometimes regarded as a playful homage to the songs of Bruce Springsteen, who was often hailed as “the next Dylan” early in his career. The lyrics include the titles of many Springsteen songs, and the song borrows many of Springsteen’s themes. (the kid who went to Vietnam, Jersey line) The setting of the song itself is New Jersey, Springsteen’s home state and the setting for many of Springsteen’s own songs. New Jersey locations such as Rahway Prison and Jersey City are mentioned by name. “Stolen Car”, “Night”, “Mansion On The Hill”, “Thunder Road”, “State Trooper”,”Paradise”, “Factory”, “The River”, “Lion’s Den”, and the song made popular by Springsteen but written by Tom Waits, “Jersey Girl” . “I like that song a lot. We’ve done “Handle With Care” and “End of the Line” before. 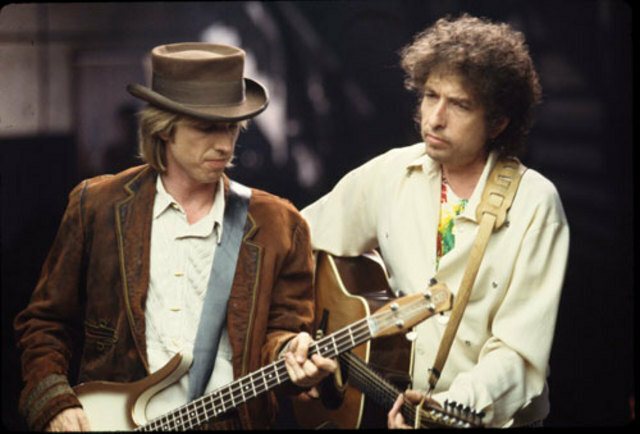 One of us said, “Are we going to do a Wilburys song?” We said, “Let’s not do one of those. How about something else?” And Tom said, “How about ‘Tweeter and the Monkey Man?” I remembered the title, but it took until he played the chorus for me to remember how it went. But then it all came back to me, and we played it a few times. The band loved it.